Spatial priorities for agricultural development in the Brazilian Cerrado: may economy and conservation coexist? The ever-increasing requirement of land for food production causes habitat loss and biodiversity decline. Human activities like agriculture are responsible for increases in global temperature, which may preclude species’ survival if they cannot adapt to new climatic conditions or track suitable ones. Although negative impacts of climate change may act in synergy with agriculture when dispersion routes are blocked by croplands, agriculture is important to local economies. Therefore, the demand for land conversion causes conflict among stakeholders and decision makers. But can we benefit both economy and environment? 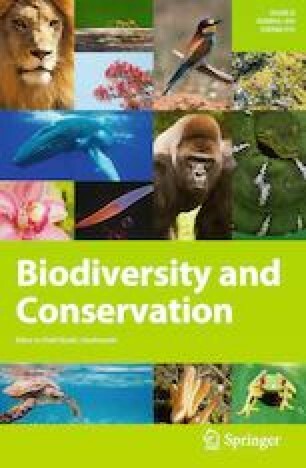 Here we propose an approach to help find a balance between agriculture expansion and biodiversity conservation. We used suitable areas for agriculture to identify priority places to implement monocultures. We modeled species distributions to avoid sites with high conservation value and used species dispersal ability to minimize the distance between present-day and future suitable areas for species persistence. We used a decision-support tool to find a balance between economic development and species conservation, and we conclude that land use conversion is a threat for species persistence given that negative impacts caused by crops could be exacerbated by climate change. Unguided agriculture expansion into future species distribution areas is possible due to severe decreases in the areas for species to persist in the future. Facing this scenario, applying ecological knowledge to guide agriculture expansion is urgent if we want to spare species future distribution area in the Cerrado. Communicated by Guarino Rinaldi Colli. The online version of this article ( https://doi.org/10.1007/s10531-019-01719-6) contains supplementary material, which is available to authorized users. We thank two anonymous reviewers for comments and suggestion that improved the paper. RL research is funded by CNPq (Grant #306694/2018-2). This study was financed in part by the Coordenação de Aperfeiçoamento de Pessoal de Nível Superior—Brasil (CAPES)—Finance Code 001. This paper is a contribution of the INCT in Ecology, Evolution and Biodiversity Conservation founded by MCTIC/CNPq/FAPEG (Grant 465610/2014-5).